The auspicious day of Akshaya Tritiya is the day for new beginnings. Book a new home, buy a new vehicle or invest in something, perhaps even in the Govt of India Sovereign Gold Bonds scheme. The abiding belief is that whatever new activity is done on this day will give you bountiful benefits ahead. One of the most popular products purchased on the day of Akshaya Tritiya is to buy something in gold, be it a god coin, a simple gold bar, a bangle or an elaborate piece of jewellery because people see it as a way to invest, the benefits to be reaped some years on when they may sell it at a higher price. Moreover, the shiny metal is closely associated with Goddess Lakshmi, the deity who brings in wealth and Akshaya Tritiya is considered to be the birthday of her heavenly spouse Lord Vishnu in his incarnation as Lord Parshuram. 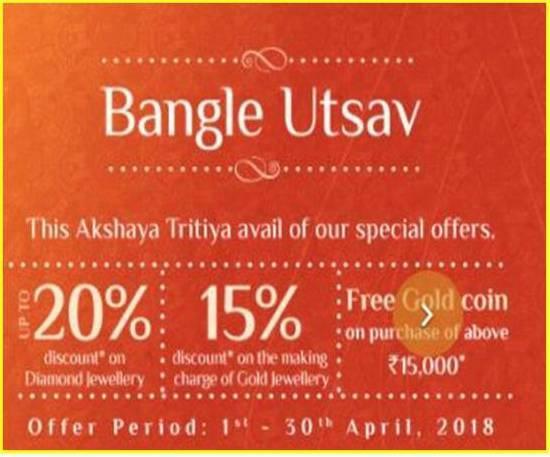 Akshaya Tritiya this year is on 18th April 2018. Let's have a look at some of the reputed jewellery brands which are giving special offers on this auspicious occasion. With exquisite bangle designs, you can adorn your hands with a touch of gold with Senco. There are unique designs for bracelets too. Whether a thick bangle or a delicate filigreed one, a honeycomb design or a rose charm, there is a wide selection to suit your taste. Up to 20% discount on Diamond jewellery. Up to 15% discount on the making charge of Gold jewellery. Free gold coin on purchase of above Rs.15,000/-. Offer period: 1st April to 30th April 2018. For Akshaya Tritiya, you can pre-book a design of your choice from the Tribhovandas Bhimji Zaveri (TBZ) store. The offer: A flat rate of 7% making charges on 22KT Hallmarked plain gold jewellery. So, for example, if the gold rate is Rs.3015/- per gram, then the making charges will be just Rs.211- per gram. TBZ Mumbai store locations: Bandra; Borivali; Marine Drive (opp. Pizza by the Bay); Ghatkopar; Santacruz; Thane; Vashi – Sector 17; Zaveri Bazar; Phoenix Mall, Lower Parel; R-City Mall, Ghatkopar; Seawoods Grand Central Mall, Navi Mumbai. Celebrate Akshaya Tritiya with Tanishq's 'Mangalam' offer. Customers can get up to 25% off on making charges of Gold jewellery and on Diamond jewellery value. This offer is valid from 11th to 18th April 2018. Flat 2.5% off on studded Solitaires below 70 cents. Flat 5% off on studded Solitaires above 70 cents. Flat 10% off on making charges of studded colour stones and plain Platinum jewellery. Up to 20% off on Mia jewellery (prices start at Rs.3,999/-). Note: There is no offer on coins, bars and loose solitaires. Two or more offers cannot be clubbed together. Additionally, you can get extra 5% Cashback on HDFC Bank Debit and Credit cards. This is for a minimum transaction of Rs.35,000/-. The maximum cashback is Rs.4000 per card account. The cashback offer is valid from 13th April to 22nd April 2018 (check terms & conditions). To know more about the offers give a missed call on 1800-30-105001. 51% off on making charges of Gold jewellery. Zero making on IGI certified Diamond jewellery. 51% on making charges of Platinum and Uncut Diamond jewellery. Kolkata's leading jeweller, P.C. Chandra Jewellers is offering gold coins to customers who purchase jewellery between 15th and 22nd April 201. They have 41 showrooms across the country. An assured gold coin is being given on every purchase at all their showrooms in India except in Agartala. Customers should check the offer dates at their city's showrooms as these dates are different for each showroom. You can also avail of the exchange facility on old Gold jewellery. Malabar Gold and Diamonds is giving customers an exclusive online offer for Akshaya Tritiya which is hard to resist! You can get a free Gold coin on every purchase of jewellery worth Rs.15,000/. If your order value is Rs. 30,000/- then you will get two Gold coins. You can get 5% value of a jewellery purchase as an E-gift Card for orders worth Rs.15,000/- and above. This Gift Card can be redeemed online for your next diamond jewellery purchase. The Gift Card is valid for six months from the date of issue. Note: The offers are valid from 1st April to 25th April 2018. It is valid on a single transaction on the official portal only & not at their showrooms. Please check terms & conditions before online purchase. So what are you waiting for? Make your shopping for gold, diamonds & platinum exciting and rewarding with these amazing Akshaya Tritiya offers!